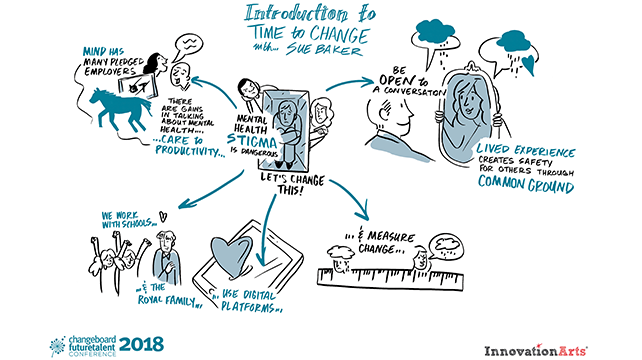 With 750 employers in England already pledged to Mind and Rethink Mental Illness’ Time to Change campaign, business is helping to transform the way people think and act about mental health. Addressing delegates, campaign director, Sue Baker, encouraged more organisations to join the movement, to help end the stigma of mental illness. She referenced the campaign’s seven principles, explaining that participating companies must develop a concrete action plan, equipping line managers to have conversations about mental illness, involving senior leadership and harnessing ‘lived-experience leadership’. Baker ended her presentation with a quick-fire poll, asking delegates to raise their hand if they would be prepared to talk openly about mental illness with close family or friends; on a first date, or at a job interview. With very few prepared to do the latter two, she explained that the campaign’s “scale of ambition is to get people to put their hands up for all three scenarios”. To watch an exclusive Q&A with Sue Baker, as well as her presentation in full, click here.